The sun has begun to shine again, the birds are chirping – and property owners around the country are busily putting together their spring to-do lists. Chores like cleaning out the garage, refinishing the deck and landscaping will be on many home maintenance lists this season. What can often be overlooked is the roof over your head. Whether on a residential or commercial building, your roof has protected you and your belongings from wind, rain, snow and hail all winter long. It has been battered, blown and frozen. 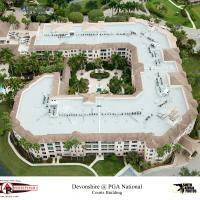 Asphaltic roofing systems are designed to require low maintenance and afford easy repairs. However, property owners must still keep a roof system properly inspected and maintained. A roof system and its components should be examined in the spring and in the fall to make sure it is secure and functioning properly. Asphalt shingle roofing systems continue to be one of the most popular roofing types in North America. Today’s manufacturers offer a wide range of designs, textures, colors and shapes to enhance the design of any home. Asphalt shingles are also designed to stand up to wind, rain and snow, but a harsh winter can gradually abrade a roof surface. Winter is also when issues like ice damming occur; ice damming may damage a roof. Spring is an ideal time to evaluate the roof on its general condition and to detect any potential problems before they worsen. Because of the nice weather in the spring, it is also an ideal time for repairs, if necessary. This spring, property owners should make sure that the following steps are taken to inspect and protect their roof systems. Perform an initial inspection from the ground or through upstairs windows where the roof surface can be observed. Binoculars are a good tool to use for the inspection. Property owners should never climb onto a roof. It is recommended that you hire a professional if you cannot safely inspect the roof from these vantage points. Keep gutters and roof surfaces clear of fallen leaves, pine needles, twigs and other litter so that water will drain freely. Keep trees trimmed to prevent branches from scuffing the roof surface. This will also keep the roof surface drier, helping to inhibit growths such as algae, moss, fungus or lichen. Keep climbing roses, vines and ivy trimmed back from the roof. Never allow water from a downspout to discharge directly onto a roof below it, as this can create additional wear to the shingle surface. Connect all upper story downspouts to a lower level gutter with drains installed on the lower roof. Inspect the underside of the roof deck from the attic to detect leaks. Flashings are the most vulnerable points; therefore, inspect the underside carefully at all flashing points for evidence of leakage, such as water stains. Remember that in cooler climates, water stains may be due to condensation as a result of inadequate attic ventilation. If an attic is vented, ensure that the ventilation is functional. You should be able to see light coming into the attic at the ridge vent or static vents near the upper portion of the roof. Light may not be visible at soffit and eave vents, because of the type of construction and/or placement of insulation, but the lack of light is not necessarily problematic. Also ensure that there are no vents from inside the home that are discharging into the attic. Only roofing professionals should climb onto a roof, and when doing so, walking on a roof should be minimized to avoid damaging the surface. When workmen have to climb onto the roof to service or install a chimney, solar collector, television antenna or other roof elements, require them to use care to protect the roofing. Avoid mounting satellite discs or other hardware to the roof surface to avoid future potential leak areas. Whenever a new element is added to the roof system, make certain that your professional roofing contractor follows proper flashing procedures to maintain the integrity of the roofing. Be sure anchors are made of a non-corrosive material to eliminate the possibility of metal discoloration or “iron stains” on the roof. These steps can help homeowners properly care for their roof and each of its components, and will identify any potential problem areas. If visible roof damage, including a leak, is detected while inspecting your steep-slope roof system, be sure to contact a professional roofing contractor. They can conduct a thorough, professional inspection and can provide specific recommendations on repairs or replacement. In addition to the general inspection steps described above, more specific actions can be taken to address issues like inadequate ventilation or algae discoloration. A balanced ventilation system allows heat and moisture to escape from an attic. Proper ventilation also helps reduce ice damming and premature shingle deterioration by keeping the attic temperature closer to the outside temperature. Ventilation is a system of intake and exhaust vents that create a flow of air. Effective attic ventilation provides year-round benefits for all types of roofing systems, creating cooler attics in the summer and drier attics in the winter, protecting against damage to materials and structure, and helping to reduce ice dams. In the winter, moist, warm air from the interior of a building will tend to rise through the ceiling into the attic, especially through bypasses where electrical and plumbing fixtures are installed. In a cold attic, the warm, moist air condenses on the cold surfaces of the rafters, the nails and other metal, and the underside of the deck. This excess water can create several problems, including causing nails to corrode and wood to rot. An improperly vented and under-insulated attic can also cause ice dams on the exterior side of the roof. Ice dams form in cooler climates during the winter when heat collects in a poorly ventilated and/or inadequately insulated attic space. Warm air near the soffits caused by air leakage from the conditioned space below combines with the sun’s warmth to melt snow on the roof, even though outside temperatures may be below freezing. The flow of melting snow refreezes at the eaves and gutters. This freeze-thaw cycle can result in a pool of water that can back up under roof shingles and behind fascia boards, soak roof decking and wall sheathing, damage exterior and interior walls, peel paint and ruin ceilings. Current model building and energy codes include requirements aimed at reducing the chance of ice damming. This is more common in older homes with lower levels of insulation in the attic. For this reason, reroofing provides the perfect opportunity to reassess the roof and attic assembly and address any deficiencies while installing new roof coverings. Installing proper intake and exhaust vents and an ice dam membrane may help reduce the occurrence of ice dams. If you noticed ice damming during the winter, it may be cause to ask a roofing professional to inspect your roof system for damage and assess your attic ventilation. It could be as simple as unblocking soffit vents that may have been covered by insulation preventing a balanced ventilation system. Now that the snow and ice have melted from your roof system, you may have noticed dark streaks on your shingles. This discoloration could be caused by algae that, although unsightly, will not damage your roof. However, there are ways you can address it. Many property owners think these streaks come from dirt, moss, fungus or tree droppings, but they are often the result of naturally occurring airborne algae. This algae is only an aesthetic consideration. It occurs naturally, is transported through the air and can collect and grow on your roof. Algae’s natural pigment can gradually cause brown or black streaks. Almost all types of roofing systems are susceptible to algae discoloration. To lighten algae discoloration on your shingles, be sure to contact a roofing professional. Your contractor should contact the shingle manufacturer to learn its precise instructions for cleaning, including the appropriate mixture to use, so that shingles are not damaged and any manufacturer’s product warranty requirements are met. To lighten algae discoloration, your contractor, using appropriate handling precautions, will gently apply the cleaning solution on the roofing surface. Never scrub a shingle or use a high pressure washing system, as either may loosen and remove granules. After a predetermined time, the solution should be gently sprayed off with water and the rinse water should be disposed of according to the recommendation of the cleaning solution manufacturer. If you’re considering buying a new roof, some manufacturers offer algae-resistant shingles that inhibit algae growth for extended periods of time. Talk to your roofing contractor or visit roofing manufacturer websites to learn about available options. Commercial property owners rely on a roof system for the same reasons a homeowner does – peace-of-mind and protection from the elements. Low-slope asphalt roofing technology provides enhanced protection from moisture, snow, hail, wind and sun. Even so, years of changing seasons and tough storms can take a toll on a roof system. Building owners must take responsibility for properly inspecting and maintaining a roof system. The proper maintenance of a commercial roofing system can mean the difference between years of seamless operations and everything from the disruption that accompanies major roof repairs to the risk of employee safety if maintenance items are deferred. By following these simple and effective steps, you can impact a roof’s service life, reliability and performance. A building owner should keep a historical record of the roof system with information about the original installation, the roof plan, the membrane type, the system components, the contractor’s contact information, the membrane manufacturer and the warranty information. All roof inspections, maintenance and repairs should be documented as well. Controlling roof access is key. Building owners should allow roof access only to trained professionals and only when maintenance is required. Roof systems are not generally designed for extensive foot traffic. Each spring and fall, a roof system should be inspected by a professional roofing contractor. The contractor should inspect each visible component of the roof system and identify areas that may require additional attention. Inspections can help to identify potential roof damage or leaks before they occur. Possible warning signs include ponding water, open seams, or loose fasteners. Routine maintenance can be conducted by the building’s trained maintenance personnel. This includes removing debris, such as construction waste or tree limbs, from a roof system. Leaves and dirt should be removed from drains and gutters to ensure drainage. Tree limbs that overhang a roof system should be trimmed. If evidence of roof damage or a leak is found during routine maintenance or an inspection, building owners should contact a roofing contractor immediately to address the issue before it gets worse. Similarly, all major maintenance procedures and roof repairs should be handled by a professional roofing contractor after consulting the membrane manufacturer. Do not attempt these actions yourself. One objective of developing a roof maintenance plan is to ensure your roofing system continues to provide protection against weather and moisture infiltration. By conducting semi-annual inspections, reviewing rooftop conditions and identifying and remedying potential sources of leaks, you can help prevent unnecessary damage and help avert subsequent repair costs down the line. In addition to these important maintenance techniques, if installing a new roof, you can add additional moisture protection by choosing the right roofing products. Asphaltic products play a large role in helping property owners weatherproof their building against the elements. While asphalt roofing products are the preferred choice for roofing systems, they are also used in a variety of other building applications to make a structure more weatherproof. Because asphalt is highly resistant to moisture, it is commonly used to make a building weatherproof from the ground up. Applied as a either a hot or cold liquid, asphaltic or bitumen-based products are used on concrete and other surfaces in basements and around foundations to form a monolithic membrane to prevent water from seeping in. These products may be used in the form of emulsions, solvent-based, or heated to provide the desired liquid application. What’s more, asphaltic products are easy to use, as they can be applied by mop, trowel, roller, squeegee or sprayed onto the surface. Modified bitumen and BUR systems provide toughness and stability by using the redundancy of multiple layers to provide long-term durability, making these roof membranes wind- and weatherproof. Their heavy mass enhances the ability of modified bitumen and BUR to stand up to the forces of man and nature. A roof consultant or qualified building professional can help identify areas of a property that may require attention to help ensure it remains leak-free as the weather changes. Proper weatherization can help to avoid leaks and the expense and disruption that can occur when an owner is forced to make untimely repairs. Whether you own a home or a commercial building, you can rely on a low-slope or steep-slope asphalt roofing system to help protect your structure. By conducting regular inspection and maintenance on your roof, you can help to ensure your peace of mind and the continued performance of your roofing system. For specific questions about maintaining your roof products, contact the product manufacturer and a professional roofing contractor. For more information about asphalt roofing systems, visit the Asphalt Roofing Manufacturers Association (ARMA) website at www.asphaltroofing.org.